In this sixth and concluding book of the Tunnels series, the Styx and their cohorts of deadly Armagi have swept across England, leaving death and devastation in their wake. It seems nothing can stop them now. Only a miracle can save the day and, in the inner world at the centre of the earth, Will and Elliott might just have stumbled upon one as they uncover ancient secrets that are fundamental to all human and Styx life. 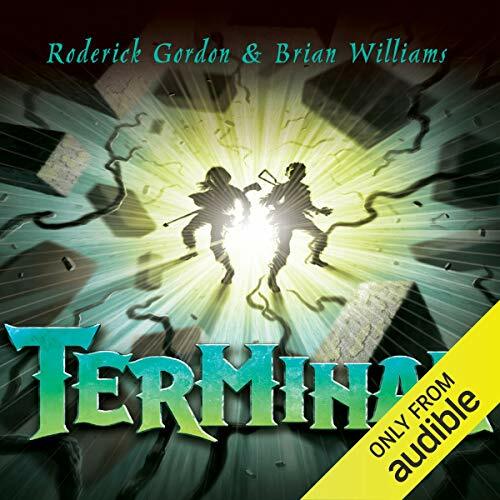 ©2013 Roderick Gordon (P)2014 Audible, Inc.
What was one of the most memorable moments of Terminal? The most memorable moment was when Elliott sprouted insect arms! What does Paul Chequer bring to the story that you wouldn’t experience if you had only read the book? The whole series is brilliant. I listen to audio books in the car, but I've had to listen to it in the house, the story is so exciting. The main characters are very well built up, you feel you know them by the end....and the story doesn't hold any punches, the tragic twists and turns are shocking and make the characters so believable. Such a shame it had to end....might listen to them all again!